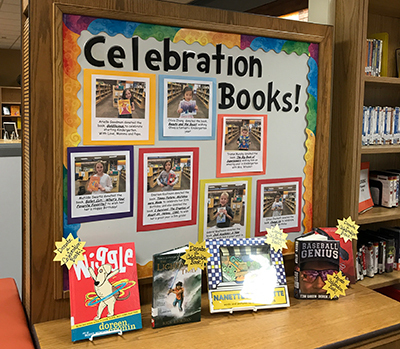 Once your donation has been received, your child will be called down to the library in approximately 2 weeks to pick out this Celebration Book. Your child will select a book from a special group set aside specifically for Celebration Books. These books cannot be checked out from the library until someone donates them to our great school. A bookplate showing the donor and the occasion being commemorated will be placed in the book. If the book is donated in honor of a staff member, a note will be sent to that staff member. Also, a photo of your child with the book will be posted.